Celebrate the process, the journey, and commit to it. Personalize this simple and elegant infinity symbol with one or two names of your choice! This is ideal for kids, twins, teens, adults, couples, individuals, everyone! Our wall decals are ideal for bedrooms, offices, living rooms, entryways, classrooms, dance floors, receptions, even your car, bathtub or glass shower doors! This Personalized Infinity Symbol wall decal is shown here in our Large size, and measures 63 inches wide by 22 inches high. Overall sizes will vary slightly depending on the measurements of the name(s). Each Infinity Sign personalized wall decal is limited to 2 names max. Need a different size or quantity? Want to add more names? Just contact us! All of our wall graphics are customizable according to your specifications. Both images show our Large version. 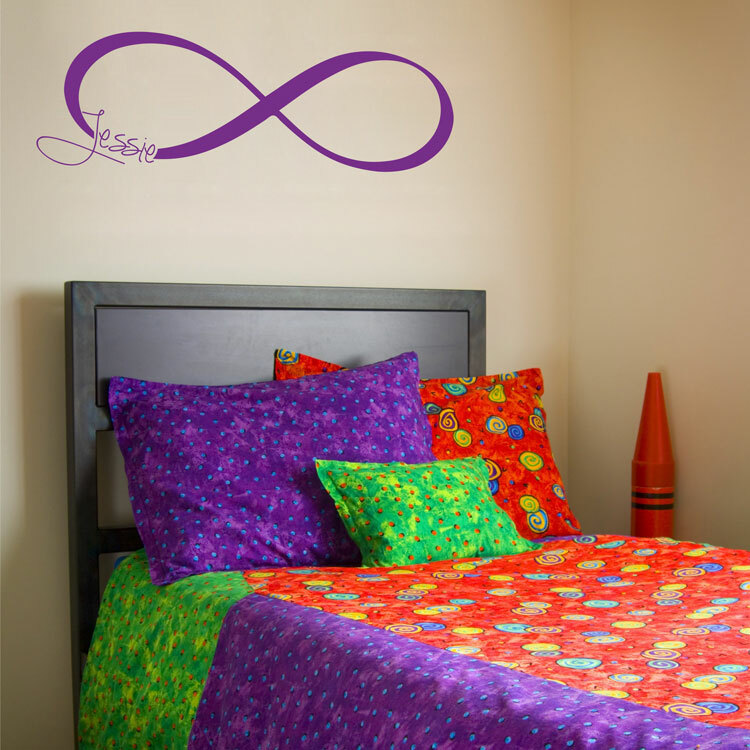 All sizes of our Infinity Symbol Wall Decals come in one piece, ready to apply! My husband and I (with a friend's help, since I am 9 months pregnant) just applied a huge tree decal in our baby's nursery and it looks GREAT! It took a little time to do but was surprisingly simple. The whole process went smoothly. Thank you for such a wonderful product! We'll be sure to shop here for our next decal. We love it! They are very easy to apply and we're already looking at getting more for our other rooms! I was so impressed to not only get help with my order, but Marisa emailed me back on the weekend! That is really amazing. Thank you so much for your help and quick service!